I recently started extracting data from Quickbooks, and have prepared an Excel VBA application that extracts the contents of each Quickbooks table into its own Excel workbook. This screen shot is a simplified version of my data extractor. There are more than 150 tables in the Quickbooks database. This simplified screen shot only lists 8 of those tables. This program is dirt easy to use. Quickbooks has a simple procedure for installing the Quickbooks ODBC driver onto any Windows computer. Once the ODBC drivers are installed, it is another simple task to authorize a Quickbooks user to be able to extract data from the database. 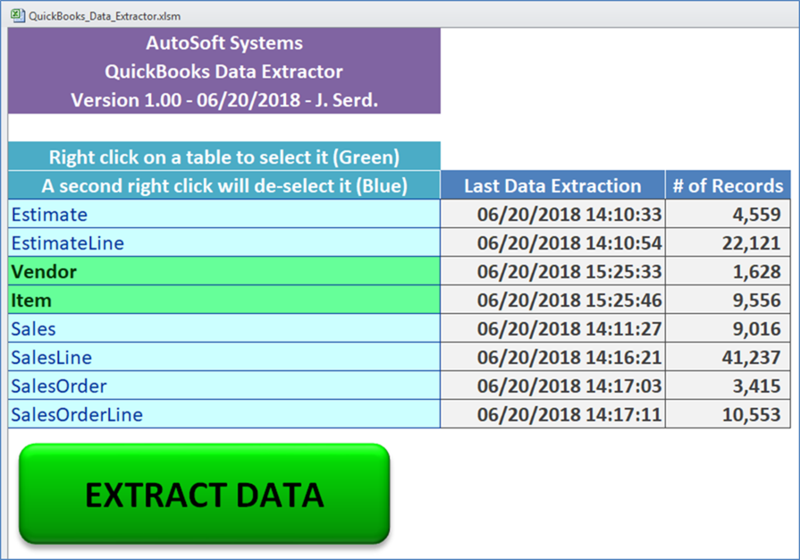 After the user has been authorized, he/she can then select whatever subset of the tables they wish to extract to Excel by turning the desired selections GREEN and clicking on the EXTRACT DATA button. The program then builds a folder with Excel workbooks, each workbook containing the contents of each selected table. The user can update the files at any time. Optionally, one can also replicate the data into SQL Server. 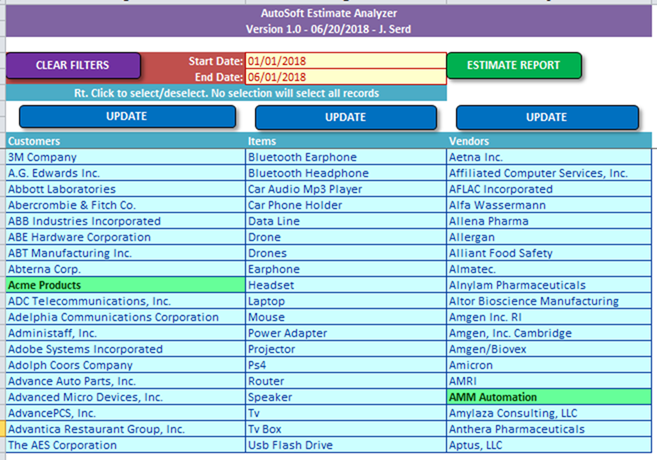 In this case the user asks the question: "How many estimates (quotes) did we provide to Acme Products in the first 5 months of 2018. Look at all of our products from AMM Automation. In just a few seconds, this report appears, which tells the user that 5 quotes were made, 3 of which resulted in sales. This report can be quickly adapted to run off of any Quickbooks installation. Further modifications/enhancements can be made as desired. This web page was last updated at 12/31/2018 11:07 AM and is written in EXCEL!